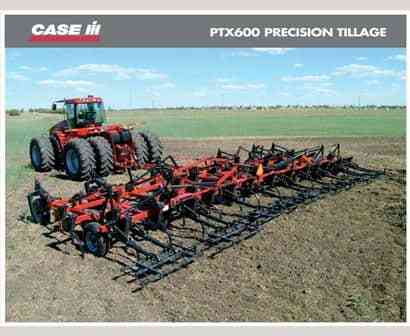 The Case IH Flex-Till 600 chisel plow is durably designed to handle tough tillage conditions. Its range of shank spacing and trip point load options match your soil conditions so you can get better leveling, even in high-residue fields. The Flex-Till 600 chisel plow sets the standard for agronomic performance with unmatched flexibility and durability. The flexibility provided by triangular frame design allows the frame to follow contours of the land, minimize frame stress, and maintain the depth you choose. The Flex-Till 600 center section and wings are constructed with diagonal hinge lines. High density polyurethane discs cushion the frame and absorb movement as the machine flexes. The result is a flexible frame with built-in durability. Adjust depth quickly and easily across a variety of fields and conditions with a single-point hydraulic depth control system. The mechanical linkage system translates the depth to the walking axles and front castors, ensuring that the depth is the same across the entire machine. Floating hitch with front single wheel caster adds more flexibility and consistent depth control to the machine. The fork style castor adds more strength to carry the front of the chisel plow through heavy tillage. The walking beam axle adds another pivot point to the machine, helping to keep consistent seeding depth. 650 or 550 pound trip True Trip design allows openers to clear obstructions up to 10" high. 3 bar HD harrows equipped with 3/8" x 16" coil spring tines. Get better leveling, even in high-residue fields. Heavy-duty components ensure reliable and low-maintenance operation. Quick and convenient single-person lock-up. Adjustable tine angle, height and down pressure adjustment lets the operator set the harrow to suit specific conditions.